You would be amazed to know how hard it is to remember to take a weekly picture! I somehow forgot on Sunday afternoon (my usual time to take since I’m home during daylight hours), so thanks to daylight savings I had an extra hour yesterday to squeeze one in. (And FYI that is the only good thing that came out of daylight savings this week. Am I the only one having trouble waking up this week?) But in that one hour, Reese wasn’t home… So this is the best I could manage with me, a small tripod and a chair. Baby’s Size: She is just over a pound and almost a foot long now! She is mostly just skin and bones right now, but will be starting to fill up the cute little baby rolls very shortly! Baby’s Progress: Her lungs are busy developing and her taste buds are developing even more as well. Mostly it is just business as usual and everything is growing strong and more developed. Weight Gain: This week I gained another 1 lb, so I am up approximately 5 lbs from where I started. I am definitely starting to feel the toll that a big old belly can take on your body, so its hard for me to mentally imagine what I’ll feel like on week 38 or 39. Sleep: I’m going to go ahead and blame it on Daylight savings, but sleep in the last few nights has been elusive. Although it could also be because Lexie decided she would start sleep training us early and decided night before last that she wanted to go play in the rain at 3am. 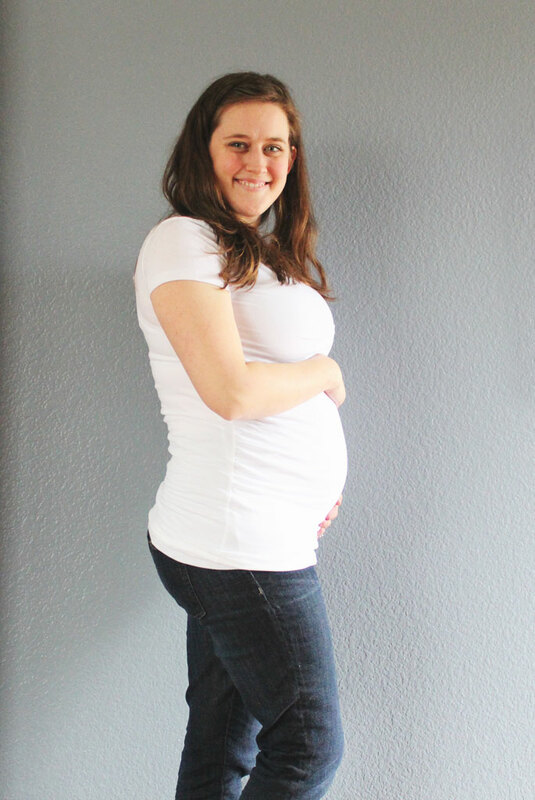 Favorite clothing item of the week: I’m pretty much living in Gap Maternity T-shirts and Maternity Jeans these days, so I’ll have to go with those this week. 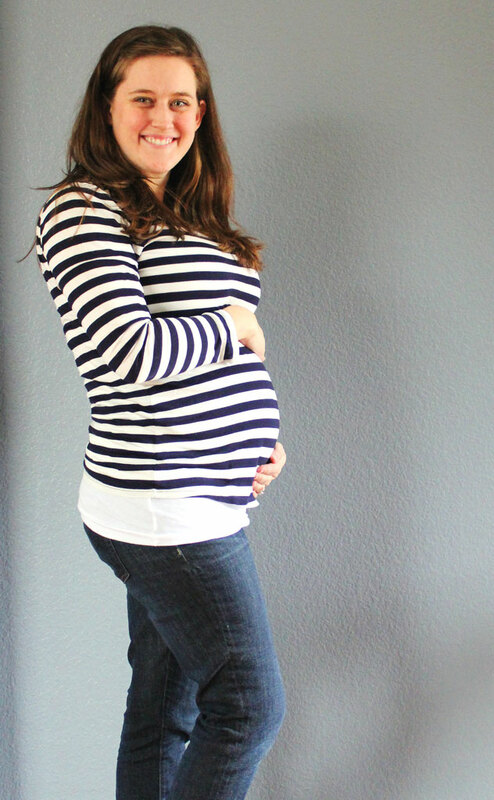 Although I am amazed at how much of my dresses are stretchy enough to fit just fine during pregnancy. I’m glad I didn’t invest in very many maternity dresses! Symptoms: My only symptom this week has been a sore back. I’m trying to focus on standing up straight and maintaining good posture. I don’t know how women who stand all day for work do it when they are pregnant! Workout: I went walking with a friend on Saturday morning. This is my favorite form of exercise; you get to catch up with a friend and are doing something good for your body!! We maybe should have turned around a bit sooner than we did, but it was a beautiful day to be out and so fun to walk around Whiterock Lake! You get a bonus picture this week! As I was taking my picture I was so worried about getting it done before dark and setting up the camera that I totally forgot to change into my white shirt! But of course, its the best picture of the bunch… so I thought I’d share! I like taking them all in the white shirt because it is easy to compare from week to week, but there is something fun about the colorful one!